When it comes to weight loss, getting your diet in check (cutting down on processed junk and upping your intake of fruits, vegetables and lean protein) is the first step. But if you want to look and feel your best in the process, lifting weights is a key component to long-term fat loss. "Increasing your lean muscle mass will translate into greater metabolic need at rest," says personal trainer Corey Phelps. And that means you're burning more calories even after you've left the weight room. "This extra caloric expenditure comes down to the density of muscle tissue in comparison to fat," says Phelps. Since muscle is denser than fat, it takes up less space in your body, and it takes more energy (a.k.a. calories) for the body to host muscle tissue over fat (6 calories per pound of muscle vs. 2 calories per pound of to fat). 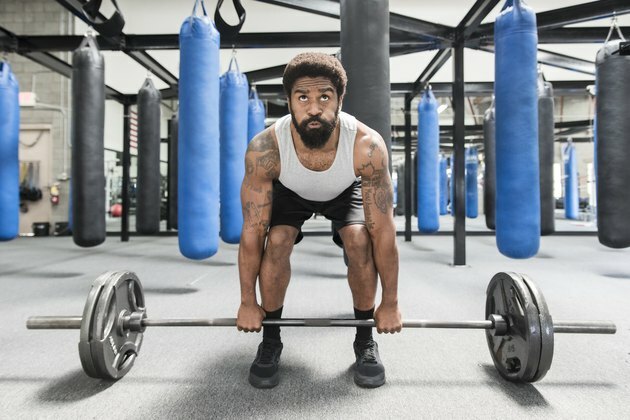 Even with all the benefits of weight lifting, it's important to keep in mind that successful, long-term weight loss comes from a true lifestyle change of better eating, proper hydration, improved sleep and rest days. It's also important to note that since muscle is denser than fat, your body composition might be changing while the number on the scale doesn't budge (i.e. you're getting smaller/leaner without technically losing weight). That's why it's important to track your progress in a variety of way. The goal of any good warm-up is to get blood pumping though your body while gently and safely limbering up your muscles, joints and ligaments. Perform the following exercises at a slow and steady pace. Jumping Jacks: Stand up straight and hold your arms at your sides, feet shoulder-width apart. Jump your feet apart and extend your arms overhead. Then jump your feet back together and lower your arms to your sides. Plank With Hip Twist: Start out in a forearm plank, forearms crossed in front of you. Keeping your abdominals tightened, twist to your left until your hip hovers over the mat, and then return to a plank. Twist to the other side and continue alternating back and forth. Squat With Full-Body Extension: Stand with your feet hip-width apart. Sit your hips back and down into a squat. Stand up, bringing your arms directly overhead and raise up onto your tiptoes. Lower back down into a squat and repeat. For the last 30 seconds, repeat this but with a jump instead of an extension. Perform each of the following exercises for 12 to 15 reps, followed by a 15- to 30-second rest in between each move. (For advanced training, jump rope in between sets or every other set to keep your heart rate and caloric burn up.) Aim for 3 to 4 sets of each. Also make sure the dumbbell weight you choose is light enough to perform the correct amount of reps, while still feeling the burn during the lifting process. Always make sure your dumbbell weight allows you to have proper form so you avoid injury. 1. Bent-Over Dumbbell Row: Hold a dumbbell in each hand and stand with feet shoulder-width apart. Bend over at a 45-degree angle and keep your back flat while you let the weights hang down from your shoulders, palms facing each other. Lift the weights up to your chest. Lower the weights back down for one rep.
2. Triceps Kickbacks: Stand with your knees bent and lean forward about 45 degrees, holding a dumbbell in each hand. Keeping your back flat, bend your arm to 90 degrees so your triceps are aligned with your back and your biceps are perpendicular to the floor. Engage your triceps and hinge back at the elbow, straightening your arm. Lower back to the start for one rep.
3. Curl to Press: Stand with your feet hip-width apart and hold a dumbbell in each hand. Your arms should be at your sides with your palms facing forward. Bend your elbows to lift the weights to your chest. Flip your hands so your palms again face forward, as you press the weights overhead and fully extend your arms. Reverse the movement back to the start for one rep.
4. Chest Fly: Lie on your back on a bench or the floor, with a dumbbell in each hand. Lift the dumbbells over the chest, arms fully extended and palms facing each other. Keeping your elbows slightly bent, lower both arms out to the sides of your chest. Pause when dumbbells reach shoulder height. Pull dumbbells back together over the chest for one rep.
5. Stiff-Leg Deadlift: Hold a pair of dumbbells in front of your thighs, palms facing your body. Slightly bend your knees and hinge at your hips, lowering your torso until it's almost parallel to the floor. As you lower the weight, keep the dumbbells close to your body and push your hips back. Pause, and then raise your torso back to the start for one rep.
6. Dumbbell Squat: Stand with your feet hip- to shoulder-width apart, holding a pair of dumbbells at your sides. Bend your knees and hinge at the hips to lower your glutes until they're parallel to the floor. Pause, and then push yourself back up to the start for one rep.
7. Dumbbell Sit-Ups: Lie on your back with your knees bent and feet flat on the floor. Hook your feet under a sturdy object (ex. heavy set of dumbbells) to anchor yourself. Hold a dumbbell in front of your chest and bend at the hips to lift your back off the floor. Sit all the way up, and then lower back down for one rep. Avoid rounding your back or neck during this exercise.